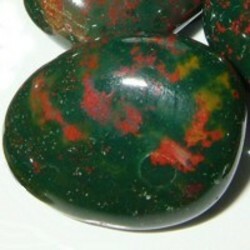 Bloodstone, one of March's birthstones, occurs in primary hues of green interspersed with maroon spots. Its primary hue is a type of quartz called chalcedony and the maroon spots are a result of iron oxide. To some these spots resembled blood and this is how the stone got its name. Since the beginning of recorded history, bloodstone jewelry has been worn for its various mystical powers. In Babylonian times, soldiers carried bloodstone pendants into war in case of serious injury; the bloodstone pendant was believed to stop bleeding on contact. Bloodstone rings and bloodstone necklaces were worn for many reasons in the Middle Ages; some wearers thought the bloodstone jewelry could make the wearer invisible; other wearers used their bloodstone jewelry to cast spells on their enemies. Today, the bloodstone is associated with intellect and bravery, as evidenced in the birthstone poem which states that the wearer of bloodstone jewelry â€œshall be wise/In days of peril firm and brave,â€� Of course, one does not need to believe in this stone's powers or even have a March birthday to receive bloodstone jewelry as a gift. It is a gorgeous stone, amazing in its understated beauty, and complements almost any outfit for any occasion.